On one level, Blitzkrieg 3 is a very traditional World War 2 RTS. There isn’t a lot of focus on terrain and cover, nor on microing unit special abilities. This is a game where you push your units around the map from an isometric perspective, and used combined arms tactics to storm villages and blast down enemy fortifications. 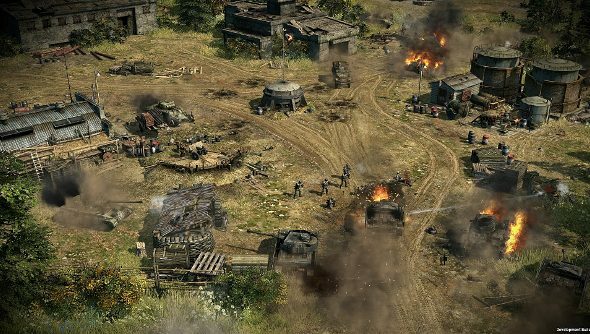 Blitzkrieg 3 will have a campaign and traditional head-to-head multiplayer, but the most interesting thing about it might just be the almost Clash of Clans-style multiplayer mode in which players will build up their own base, defend it, and try and storm other players’ bases for resources. Once you have your base ready and production buildings down, you can take your army and attack other players for their resources. Those resources will be useful for new buildings and better units, if you can storm your opponents’ bases and take the resources. “This was the biggest innovation for us, because previously, asynchronous games were not… I would say they were not popular on the PC. There were some of them on mobile, and they were doing very well there, but we wanted to it much more deep and removing all their monetization features, which are very heavy in mobile,” Orlovsky said. Blitzkrieg 3 definitely uses recognizable moves from the mobile gaming playbook. When your base comes under attack from another player, you can choose to have push notifications sent to you so that you can hop online and attempt to fend-off the assault in-person, at which point you are playing a more traditional head-to-head game against another player. But if you’re not around, the bases defenses you built, and the units you left garrisoned there, will do their best to stave-off the attacker. The more you have at your base, the more tempting a target you become, too. Because some of the higher-level buildings require huge resource stockpiles before you can build them, other players searching for targets will see a much higher payout if they can storm your base. So the bigger your castle, the more the other kids want to come and knock it down. Orlovsky admits that Nival are still fine-tuning the balance. He doesn’t want it to be too punishing when your base gets overrun, but at the same time, he wants to promote that kind of conflict between players. The other problem they’ve identified during Blitzkrieg 3 Early Access is that highly-active players rarely have many resources in their stockpile, because they spend it all. So the people who would be most likely to participate in a base defense are the ones who get the least opportunities to do so. Yet Orlovsky thinks, with some justification, that this probably the direction multiplayer should be moving. It’s something Nival have been thinking about ever since they saw Backyard Monsters on Facebook. 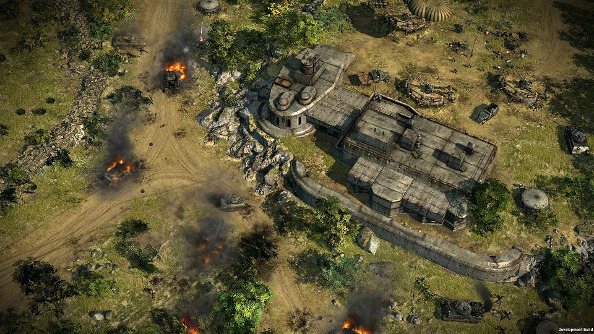 The nice thing about doing it it in Blitzkrieg 3, Orlovsky says, is that putting it inside a more traditional PC RTS makes for a better experience.